As the once vegetarian that I was, believe me when I say that there are few things better in life than a sizzling sausage and a beer. Sternen Grill is a must in Zurich for any local or tourist. It is not fancy, nor a place to sit down or show your best dress. Here there’s crowds, bratwurst, cervelat, crusty bread rolls (Bürli), homemade mustard, their famous Sternen Bier and a need for napkins to capture all those tasty grill juices. During the summer, it’s a favorite spot to stand around for a bite after work, or to have a quick break on the weekend while strolling around the city. No, it might not be the best rated, cheapest sausage in town, but to me it’s one of those locally beloved places that have been around forever – since 1963, actually – and that deserves to be tried. My recommendation, try their St. Galler bratwurst with Bürli. Also, make sure to pick up some of their spicy mustard. Hits your nose like thunder, but nothing that a gulp of cold beer can’t wash down. Sternen Grill offers both a takeaway/standup section and a casual sit down restaurant. Salads, fries and other fast food delicacies are also offered. 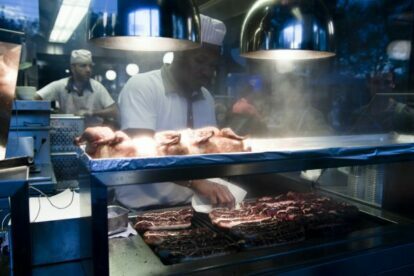 If you come across one of many other grilling stands around the city and you have not yet been to Sternen Grill, keep walking. Places like this are a sweet reminder of how much I enjoy not being a veggie anymore.